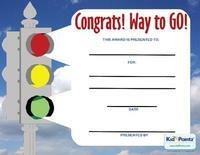 These congratulations certificates are a great way to recognize a child for achieving a goal or accomplishment. Certificates for kids let your children know you care about them and support them to achieve their goals. 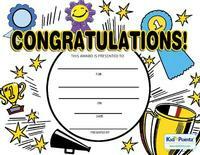 This congratulations certificate is a great way to say thank you to a child for achieving a goal or accomplishment. Certificates for kids let your children know you care about them and are helping them achieve their goals. 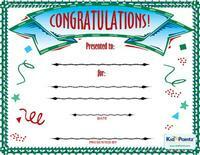 Congratulate your child for just about any accomplishment with this free printable certificate. Your kid will appreciate being recognized for their achievements and strive to repeat their actions in the future. 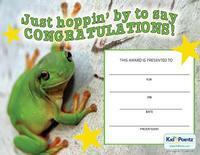 You can congratulate your kids for just about any achievement with this free award certificate. Recognizing the accomplishments of your child provides positive reinforcement and acts as an incentive to repeat their actions in the future. 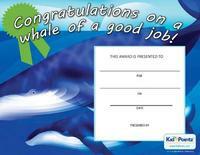 Show your child that you appreciate the great job they did with this award certificate. Your child will appreciate the recognition they receive and strive to continue with their good efforts in the future. This award certificate is perfect for congratulating a child for just about any accomplishment. Presenting an award certificate to a child shows you care about them and support them with achieving their goals.